All my adult life I have been puzzled by the praise heaped on the Impressionists, at least on the "landscape" Impressionists like Claude Monet. What could be more boring than painting exactly what you see? That was in essence the argument, that the Impressionists had broken with centuries of tradition to paint not what they imagined from within the studio but what they saw en plein air. To my mind that would be copying, the same copying of external nature that Plato and other art theorists had dismissed as shallow, misleading or lacking insight. Portraiture is low down on art's totem pole for the same reasons. 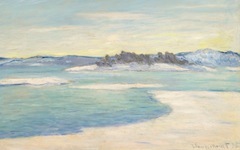 It is true that more recent specialists have seen political and cultural meaning in Monet's scenes and have even pointed out that many of his canvasses were finished in the studio. Yet how could copying, say, the same view of Rouen Cathedral day after day, even at different hours, be called "art"? An exercise in craft, perhaps, but art? Where is the poetry? If technique alone - and that includes Monet's novel style - explains the difference between Monet's art and my mother-in-law's landscape, the Frenchman would have been a better craftsman but no artist. Artists, it is important to remember, must look inside themselves. 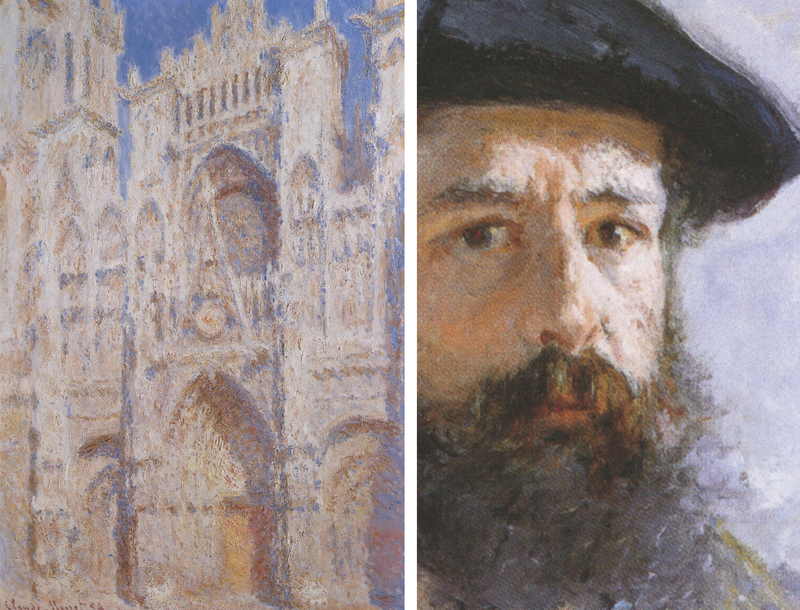 Claude Monet was 52 when he started to paint the facade of Rouen Cathedral. The first couple of attempts view the portal face on, from directly in front of the doorway. 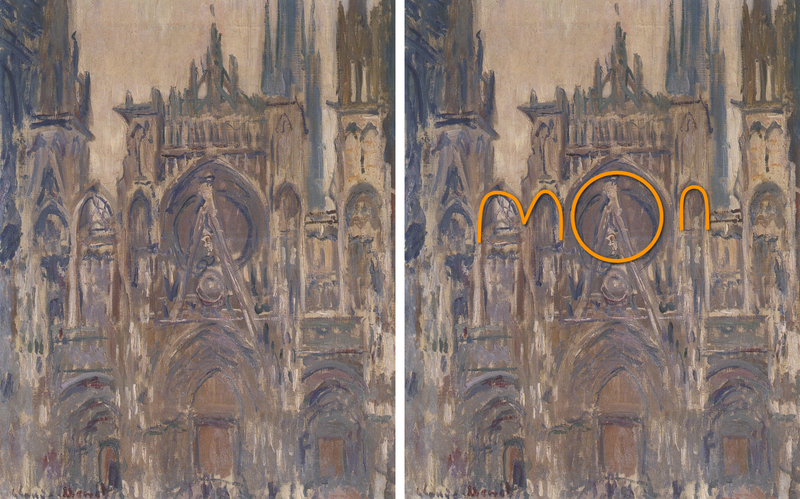 It is difficult to be certain because Monet was such a subtle artist but it seems to me that he chose this viewpoint for a reason: the arches on either side of the ocular window allowed him to imagine the first three letters of his last name: MON. On one side of the ocular O a double arch appears to form the letter M while a single one on the other side forms a N (see next page). 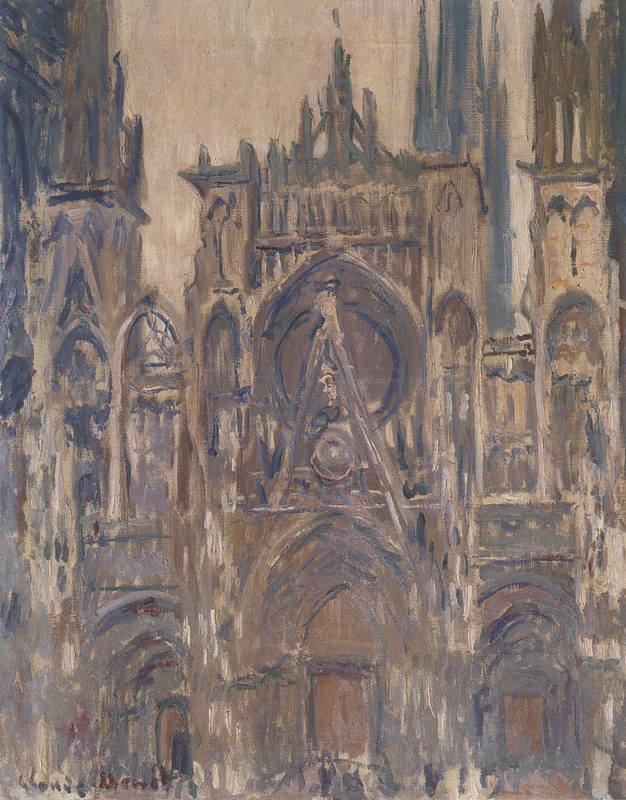 In claiming ownership of the cathedral Monet indicates that this is not a cathedral in Rouen but in his mind. Monet, who was more spiritual than religious, must have imagined that even the masons of medieval cathedrals designed their cruciform masterpieces as external reflections of man's inner divinity.1 There is also, for those with imagination, a diagramatic "face" in the facade with two small "eyes" on either side of the ocular window, a "nose" in the triangle in between and a "beard" in the arch. The central "O" is the traditional inner eye of wisdom. 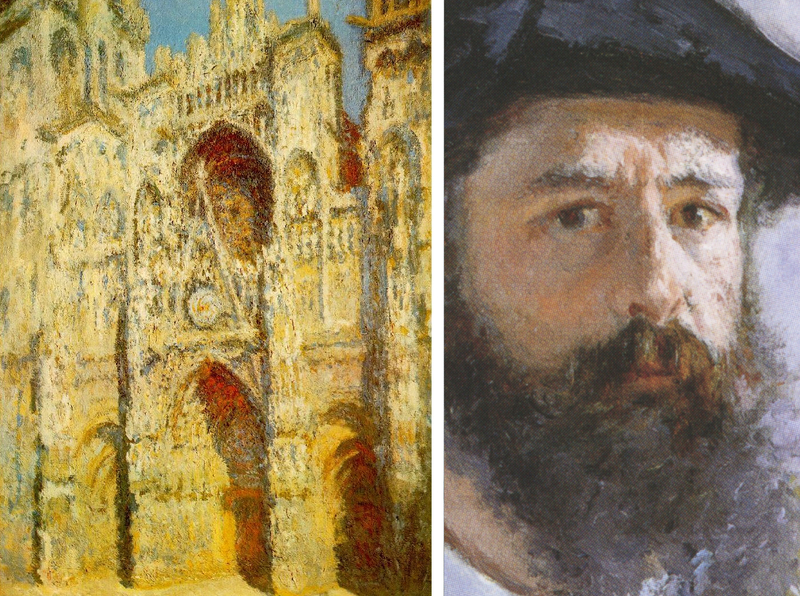 Is it a "prophet" or Monet himself? 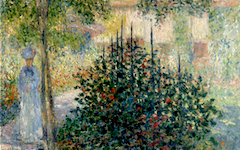 Perhaps Monet was not entirely happy with the poetry of the results because he then moved his viewpoint slightly to the right. It was a significant move because the spire above the portal no longer bi-sects the O in half. It moves the center of the ocular window, previously the eye of wisdom, to the right as well, where it becomes an open and astonished real "eye", its pupil clearly visible to the right side of the triangular "nose". 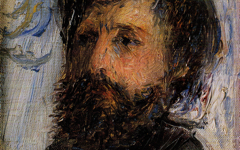 The "face" here is not as obvious as those by Corot, Cézanne, Gauguin and Van Gogh revealed in separate entries. It may not even be Monet himself though it seems to suggest my memory of "Monet". Note, in addition, how the painted highlight on the tip of his nose - it would be the same on all noses - is matched by a similar spot on the facade. 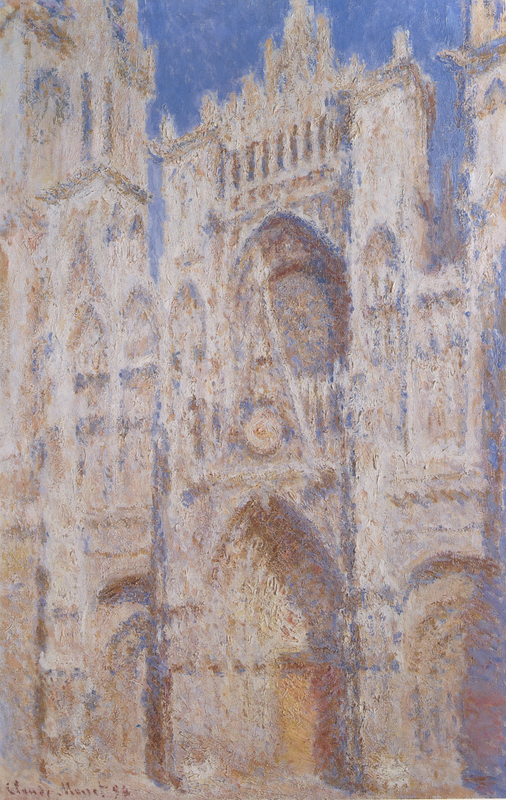 Monet's later images of the cathedral become more diffused. Even so, the same architectural features though less obvious are still visible. They are also exceedingly important. We can now be certain that Monet was not copying what he saw, as so long believed, but attempting to capture in paint the full power and glory of the creative moment as experienced inside the mind of a great master. Was Monet's mind full of oceanic mysteries? Is landscape portraiture? Monet clearly thinks so. Original Publication Date on EPPH: 05 May 2012. © Simon Abrahams. Articles on this site are the copyright of Simon Abrahams. To use copyrighted material in print or other media for purposes beyond 'fair use', you must obtain permission from the copyright owner. Websites may link to this page without permission (please do) but may not reproduce the material on their own site without crediting Simon Abrahams and EPPH.